Champaran and Bhagalpur districts. 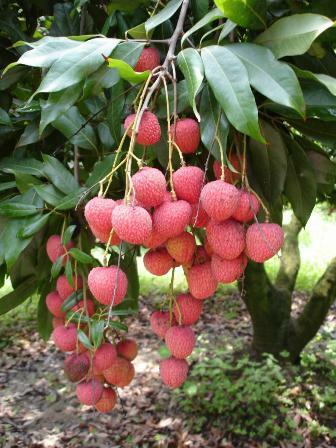 Litchi is famous for its excellent quality, pleasant favour, juicy pulp (aril) with attractive red color. 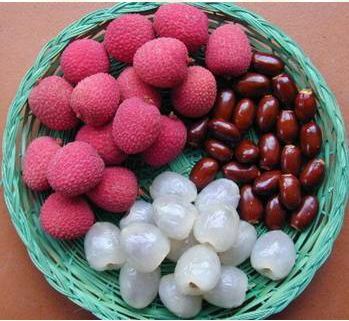 Although litchi is liked very much as a table fruit, dried and canned litchis are also popular. A highly flavoured squash is also prepared from its fruits. The fruit consists of 60 % juice, 8 % rag, 19 % seed and 13 % skin varying upon variety and climate. Litchi is also an excellent source of vitamin C(40.0-90mg/100g) but it contains insignificant amount of protein (0.8-0.9%) fat (0.3%), pectin(0.43%) and minerals especially calcium, phosphorus and iron (0.7%). Generally it flourishes best in a moist atmosphere, having abundant rainfall and free from frost. Its plants grow luxuriantly at 30 C. the maximum temperature during flowering and fruit development varies from 21 C in February to 38 C in June in Bihar. Humidity is another important factor for litchi. The hot winds in summer cause fruit cracking and subsequently damage the pulp (aril). Sometimes it limits the expansion of litchi cultivation. Wet spring, dry summer and light winter are desirable conditions for fruiting in litchi. Litchi grows in a variety of soil types. However fairly deep, well drained loam soil rich in organic matter is best suited for its cultivation. Light sandy loam is ideal. High lime content in soil is also beneficial to its trees. If soil is deficient, lime must be added to it. Soils in north Bihar, where best litchi is grown, contain about 30%lime. A sandy loam or clay loam with a pH of 5.5-7.0 and sufficient soil depth is ideal for litchi cultivation. A large number of varieties are grown in different parts of India. Of these, Early Seedless (Early Bedana) , Rose Scented, Dehradun, Gulabi, Calcuttia, Purbi, Kasba, Shahi, Bombai, Late Seedless (Late Bedana), China and Deshi are important. Shahi, Rose Scented and China are commercial varieties of Muzaffarpur, while Kasba and Purbi are the choicest litchis of the eastern parts in Bihar. Early Bedana and Late Bedana are other important litchi varieties. In Uttar Pradesh, Rose Scented, Dehradun and Calcuttia, and in West Bengal, Bombay Green and Kalyani selection are extensively grown. Muzaffarpur, Dehradun, Seedless and Late Bedana are widely grown varieties in Punjab. An early, non-cracking seedless selection, Swaran Roopa, has been identified for commercial planting in Chhota Nagpur area. Litchi is raised both through seed and vegetative means. Propagation by seed is not common because the plants raised from seed take 7-12 years to come into bearing. These plants normally do not produce true to type fruits and often produce fruits of inferior quality. Seeds are used generally to raise seedlings for rootstock purpose or raising hybrid seedlings. They should be sown immediately after extraction from the fruit, as they lose their viability in 4-5 days. If seeds remain in the fruit and fruits are not allowed to dry, they can be kept viable for 3-4 weeks. For germination, seeds soaked in water for 18-20 hours should be placed horizontally about 1.5 cm below the surface of a well drained soil. The growth of seedlings may be improved by the use of mycorrhizal soil. Litchi can be propagated successfully by cuttings and grafting (splice and inarching). Budding is not commonly practiced. The most common and the easiest method adopted all over the world is air layering. Air layering is also called “marcotting” in china and “gootee” in India. About 2 cm wide ring of bark is removed just below a bud from a healthy and vigorous twig about one year old and 2.5-4.0 cm across. The cut is then surrounded with a mud ball containing sphagnum moss (2 parts of damp moss and 1 part of soil from the foot of old litchi tree is best suited) and wrapped with a polythene sheet. Both ends are tied with fine rope or rubber bands to make it practically air tight. When sufficient roots are formed in about 2 months, the branch is cut below the soil or sphagnum moss and potted in a nursery. July –October is the most appropriate time. After removing the air layers (marcotts) from the mother plant, it is desirable to provide some moist or humid atmosphere by sprinkling water mist for further 2 or 3 weeks. It is necessary to cut back the top of the branch, so as to secure a proper proportion of leaves to root. At least 6 months old marcotted (air layered) plants should be planted in the permanent field preferably in monsoon (rainy season). I BA (2-10 g/litre of water) is the most effective in root promotion in air layering of litchi. Before planting, the land should be cleared and levelled with gentle slope on one side of the plot, on the opposite direction of irrigation source. Then pits of 1 m x 1 m x 1 m size should be dug at the desired places a few weeks before the actual planting. These are kept open for 15- 20 days and then refilled with a mixture of well rotted farmyard manure, leaf mould and canal silt. A mixture of farmyard manure (20-25 kg), bone meal (2kg) and sulphate of potash (400g) is also recommended to be mixed with a basket full soil in a pit from a litchi orchard, containing mycorrhizal fungi. It is helpful in establishment and quick growth of newly planted plants. The pits are watered to set this mixture with the earth. Planting is done after a week. Water is applied immediately after planting. 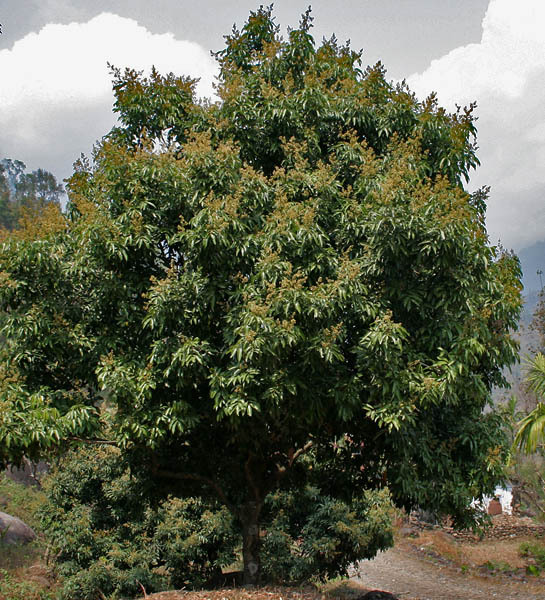 Litchi trees are usually planted square system, 10 m apart. The distance can be reduced to 7.5 m apart each way where litchi plants need protection either from frost or from the desiccating winds. For quick establishment and less mortality, healthy 6-9 months old, true to type plants, with fine roots should be selected. It is advisable to inoculate all the new plants with mycorrhizal fungi. After planting, the land should not be allowed to dry completely. Hence the new plantation is recommended during early monsoon season. Planting can also be done in the spring, if irrigation facilities are available. Planting is not advisable when the weather is either too dry or too wet. Training young litchi plants for making a good framework is necessary. Once the desired shape and a strong framework is achieved, pruning is not required, except removing dead or diseased branches and damaged shoots. In India, this occurs indirectly when a part of the shoot bearing the cluster of fruits is removed during harvesting. However, heavy pruning of tree causes profuse vegetative growth resulting in poor fruiting. If trees become too old and produce small sized fruits, pruning heavily improves the yield and quality of fruits. In India, litchi is grown mostly in natural fertile soil. A little of no manure is given. The acute shortage of N, P and K seems to stunt all forms of litchi growth, including floral initiation. The fertilizer schedule recommended for litchi for north Indian plains is given in tables 1 and 2. Fertilizer should be applied just after harvesting during the rainy season. If fertilizers are applied late, there is more vegetative growth and less fruiting. Method of Manuring is similar to that of other fruit crops. The plants grown under deficiency of NPK can flower but do not set fruits. The plants grown under Mg deficiency do not even bloom. Maintenance of good sanitary conditions is must to keep litchi orchards healthy and disease free. Litchi is a deep rooted tree with most of its feeding roots occurring 20-30 cm deep. Therefore, deep tillage is harmful for its plant since it may cause injury to its roots. Tillage operations should be limited up to upper 7-10cm soil layers, whereas deep tillage up to 15 cm during inactive growth phase is advised. Since litchi is a slow growing tree taking at least 6years to come to flowering and fruiting, intercropping vegetables, pulses and berseem is advised. Some quick growing fruit plants like phalsa and papaya can also be grown in early years of its plantation. The intercrops should be manured separately and protected from pests and diseases. Weeds are controlled mainly by hand weeding or hoeing which is very laborious and expensive. Applying pre-emergence herbicides diuron or atrazine @ 2 kg /acre at one month interval keeps weeds under control. Use of black polythene mulch also controls weeds more effectively than organic mulch. January end to the onset of monsoon is a critical period for irrigation since vegetative growth and fruit development take place. Four months prior to normal floral initiation period (December-January) in northern India, the plants should not be irrigated. Though litchi is a deep rooted, perennial fruit crop, the absorbing roots mostly occur in the upper topmost soil layer between 20 and 30cm depths. Therefore, this zone should have 50% soil moisture during the critical period. Young trees should be irrigated by the basin system. As the tree grows, the basin should be gradually enlarged. The fully grown trees are irrigated by flooding or by furrow irrigation, depending on the availability and source of water as per their requirement. The frequency of irrigation ordinarily depends on soil type. Generally weekly irrigation should be given in summer. No irrigation is required during winter in fruiting trees before fruit set. individually to avoid skin rupturing at the stem end and quick rotting of fruits. They are harvested in bunches along with a portion of the branch and a few leaves. It prolongs the storage life of fruits. Harvesting of litchi is usually done in May and June. In Bihar, it is done in early June. In India, yield varies from 80-150kg fruits/ tree depending upon variety and tree vigour. After harvesting, fruits should be packed as quickly as possible, as their quality deteriorates markedly, if they are exposed to sun even for a few hours. In packed litchi fruits, air should circulate freely. The damaged, sun burnt and cracked fruits should be sorted and graded properly. There should be only fruits of one grade in a box. Fruits of different varieties should be packed separately. It is better if the box or container is tagged having name of variety and grade. These are lined with litchi leaves or other soft packing material as paper shavings, wool etc. To maintain quality and avoid gluts, fruits should be stored properly. Keeping fruits in storage at 5-7 C may minimize the losses. Besides retaining color and taste, the storage also minimizes the heavy loss in fruit weight. At present almost entire litchi crop in India is consumed fresh. Since litchi is a highly perishable fruit, it’s canning and preserving into squashes, jelly and juice is desirable to utilize surplus produce, if any. The fruits for local market should be harvested at their full ripe stage, while for distant markets they start turning reddish. If marketing of packed fruits is delayed, they should be kept in a cold storage. Litchi fruits can be stored in good condition for 3-4 weeks. Sun burn and skin cracking in developing fruits are two serious problems in litchi. High temperature, low humidity and soil moisture conditions during fruits development promote these disorders. Inadequate moisture during early period of fruit growth results in the skin becoming hard and sun burnt. It may crack when it is subjected to increased internal pressure as a result of rapid aril growth following irrigation or rain. Fruit cracking in litchi is also favoured if temperature goes above 38`C and relative humidity less than 60%. Although effective control measures have not been recommended, frequent and adequate irrigation to bearing trees during fruit growth and development period is most useful. Growth regulators NAA ( 20mg/ liter of water), GA ( 40 mg/ liter of water), 2,4-D (10mg/ liter of water), 2, 4,5-T (10 mg/ liter of water) and Ethephon (10 mg/ liter of water ) reduce the incidence of fruit cracking. Spraying with Zinc Sulphate ( 1. 5%) weekly or Calcium Nitrate (1.5%) fortnightly from pea size to harvesting of fruit is an effective method to reduce cracking.